In August 2002, at the age of 29, Serina Dosen discovered that her flu like symptoms were actually Acute Myeloid Leukaemia (AML), a life threatening blood cancer that strikes around 900 Australians each year. Today, twelve years after receiving her life-saving bone marrow transplant, Serina still faces the emotional challenges associated with permanent hair loss. Serina was placed in complete isolation while undergoing chemotherapy day and night for seven days, and after battling a series of life threatening complications, it soon became clear that a bone marrow transplant would offer the best possible chance of survival. “I remember getting up and showering each morning and looking into the mirror and all I saw was a complete stranger staring back at me. We waited and waited for my blood cell count to return to normal and when that day came I was wheeled outside into the fresh air. That first sensation of fresh air on my skin was like nothing I have ever felt before. I will never forget that moment. My family and I were so excited. I couldn’t get into the wheelchair fast enough. I didn’t care that everyone stared at me because I looked so terrible, I was simply elated to be let outside,” said Serina. Not long after the transplant, Serina’s hair, eyebrow, eyelashes, fingernails and toe nails grew back; but she started to experience the first signs of what would become chronic graft versus host disease – a side-effect of a bone marrow transplant that can severely affect the skin. In 2013, Pantene donated a variety of human hair wigs to the Tracey Scone Wig Library through their Beautiful Lengths campaign. 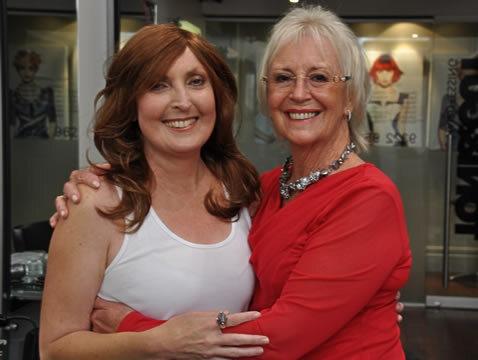 These wigs will be used to support women suffering from permanent hair loss. Colleena Presnell, a director of the Arrow Bone Marrow Transplant Foundation, and past patient, said, “This year, Arrow’s Tracey Scone Wig Library celebrates a decade of helping cancer patients overcome the vulnerability associated with hair loss. As well as having to deal with the stress of permanent hair loss, Serina’s condition has left her scalp too sensitive for an acrylic wig, so I am thrilled that the women of Australia and New Zealand have supported Beautiful Lengths,” said Colleena.